I got a couple of charts today! 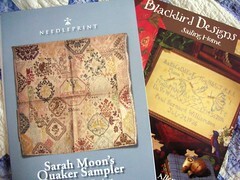 The new Quaker Sampler Sarah Moon and Blackbird Designs Sailing Home. I want to stitch Sailing Home as a birth sampler for Matthew. I'm feeling much better today. Still a little tired, but not nearly as bad as yesterday. I'm not sure what was going on! Matthew has been waking up during the night again lately, that could be part of it. He must be going through a growth spurt! Glad that you are feeling better! I think that Sailing Home would be great for Matthew. He is getting bigger by the day. Too cute! 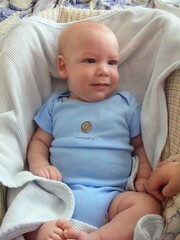 I love that new Quaker chart and your little baby is such a cutie! I'm eager to start Sarah Moon - I love that piece and look at the chart often! I like the Blackbird design you pictured - might have to get that one! Glad your feeling better. The BD will be a beautiful birth sampler for Matthew.